This is a limited 2-day only sale that will expire at midnight on Thursday, November 18, 2010. Click here to buy now or for more information about the deal. Don’t miss out! Limit 2 per person, may buy 1 additional as a gift. Limit 1 Groupon per every 2 people per table. Dine-in only. No cash back. Tax and gratuity not included. Reservations recommended. 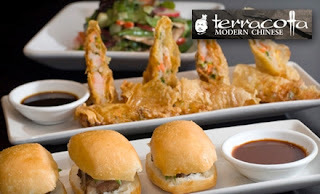 For $15, you get $30 worth of contemporary Asian fare and creative cocktails at Terracotta Modern Chinese, located on Alexander Street. The knowledgeable, friendly staff at this chic Gastown “resto-lounge” serve up a sophisticated menu of contemporary Chinese tapas alongside an inventive selection of clever libations, including specialty Terratinis. Three dining spaces—a patio and lounge, dining room, and Emperor’s room—comprise the sleek eatery, where a stylish crowd convene to eat, drink, be merry, and pore over runic texts amid the dark, minimalist décor. This is a limited 1-day only sale that will expire tonight at midnight (Tuesday, November 16, 2010). Click here to buy now or for more information about the deal. Don’t miss out! Limit 2 per person. Limit 1 per visit. Not valid until 11/17 at noon. In-store only. May use with “LYB Club” discount, and is valid toward individual sale items. Must use in 1 visit. View complete terms. Valid at all Canada store The Body Shop locations. Ruthlessly devoted to environmental stewardship, The Body Shop regularly relies on natural and sustainable materials to power its prettifying products. The ingredients of many items are sourced through the company’s Community Trade program, which has provided reliable income and market access to more than 25,000 people in marginalized locales around the globe. 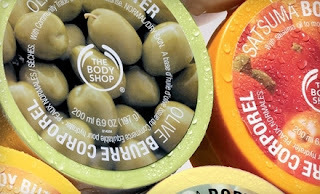 More than 13,000 Facebookers are fans of The Body Shop. Products from the store are frequently featured in such publications as Vogue, Cosmopolitan, InStyle, and Allure. This is a limited 2-day only sale that will expire at midnight on Tuesday, November 16, 2010. Click here to buy now or for more information about the deal. Don’t miss out! Share this deal with your friends and make this a group outing. Limit 1/person, may buy multiple as gifts. By appt. only. New clients only. Women only. Non-transferable. 10 class max/location. Tax not included. Not valid w/ other offers. The inspiring trainers at MetaBody lead troops of women workouteers in results-getting hour-long workouts several times weekly. The fun classes utilize a variety of exercises and disciplines to produce full-body results in a supportive environment ideal for both beginners and hard-core core-hardeners alike. MetaBody’s motivational instructors will use your instinctual distrust of routine to their advantage. They’ll keep your muscles guessing with new and challenging moves during each session, so you’ll never fall into a boring, ineffective routine like regular teeth brushing. Begin a long day of litigating with a refreshing 6:00 a.m. squat session, or end an evening by burning evidence and pounds with a 7:15 p.m. class. In addition to the fitness classes, you will receive a success guide to help prepare for imminent pound-loss, a nutrition guide, and a $100 gift certificate for individual coaching. Working out with others helps you stay motivated, make friends, and plot government coup d’états at your convenience, all while getting fit and staying healthy. So take this opportunity to tone up, shed pounds, help a good cause, and plan the future with a new band of fit friends. At the time of this post, they have already sold over 900+ vouchers. If you click the Groupon link to buy and see another deal featured on the main page, just look on the right-hand column and you should be able to find this deal. Groupon is currently featuring 3 days in Vancouver right now. This is a limited 1-day only sale that will expire tonight at midnight (Sunday, November 14, 2010). Click here to buy now or for more information about the deal. Don’t miss out! Limit 10 per person, may buy as gifts. Reservation required; subject to availability. Gratuity not included. Not valid with other offers. HST included. Groupon. 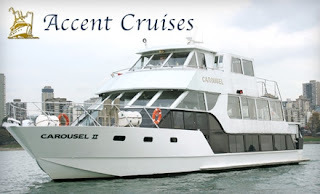 For $72, you get two tickets to Accent Cruises’ Carol Ship Dinner Cruise, running daily from November 21st to December 21st and boarding at 6:30 p.m. on the west side of Granville Island. The three-hour dinner cruise invites patrons to curl up beside a romantic private table, aboard a yacht outfitted in the most stylish of seasonal garb for a feast of traditional Christmas comfort fare, complete with honey glazed ham, buttery vegetables, and hallucinated sugar plums. Views of the Vancouver Harbour soothingly stimulate eye sensors and the singing of carols cultivates a camaraderie only achievable on land by sacrificing your last stick of gum. 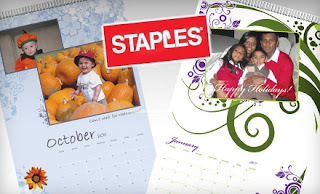 This is a limited 3-day only sale that will expire at midnight on Sunday, November 14, 2010. Click here to buy now or for more information about the deal. Don’t miss out! Limit 2 per person, may buy 1 additional as a gift. Limit 1 per table of 2. On game days, valid only after 7pm. Tax and gratuity not included. Not valid with other offers. Eating a hearty steak is a more kingly act than wearing a crown or banishing the dog to a small island in the South Atlantic. 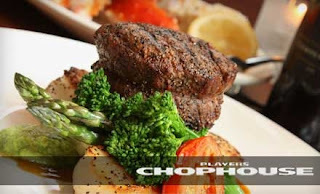 Get the royal treatment with today’s Groupon to Players Chophouse, located near the corner of Beatty Street and Robson Street. Players Chophouse fills forlorn bio-feedbags with a variety of satisfying steaks, seafood, and sides showcased on their classic steakhouse menu. An array of specialty cocktails supplements meals with innovative alcoholic twists, and the attentive staff stand guard to answer any questions concerning menu items or to protect patrons from hungry hordes of carnivorous poltergeists. High ceilings, booth seating, and a spacious bar imbue Players with a casually elegant feel, and an inviting outdoor patio coos to clients with promises of scenic views and complimentary oxygen. This is a limited 1-day only sale that will expire tonight at midnight (Thursday, November 11, 2010). Click here to buy now or for more information about the deal. Don’t miss out! Limit 1 per person. By appointment only, subject to availability. Extra charge for base filling & repairing. No cash back. Tax not included. Allow 4 days for tune-up. For $15, you get a ski or snowboard tune-up at Sports Junkies on West Broadway. Sports Junkies is a purveyor of new and used sports equipment and boasts new snowboard clothing at wholesale prices. Their knowledgeable snowmen also administer ski or snowboard tune-ups to get battle-scarred boards ready for the snowy season. Edges are bevelled, sharpened, and de-tuned, while bases are ground, waxed, and texture-brushed for maximum volume without hairspray. Like a visit to the dentist or dermatologist, filling of major gouges comes at an additional fee. For the skinny on Sports Junkies’ sizable number of services, check out their repairs page. This is a limited 1-day only sale that will expire tonight at midnight (Wednesday, November 10, 2010). Click here to buy now or for more information about the deal. Don’t miss out! Limit 1 per order. Not valid until 11/13/10. $10 broker fee and GST not included. Not valid with other offers. Shipping included. May apply toward upgrade. With a quick, electron-enabled visit to Picture It On Canvas’s product descriptions and a photon-carried look at its how-to template, customers can dive into the world of art, interior décor, and science simultaneously. Select a prize photo (digital or analog) from your archives and then use the online order form to begin your photomorphosis. 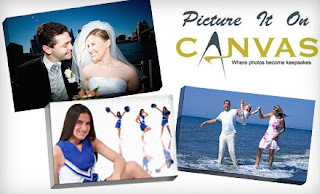 Picture It On Canvas’s 16″x20″ canvases are made of archival-quality material, which is thicker, more durable, and less likely to get stuffed into a roommate’s back pocket and creased than the original photo-paper medium. Its thick-bar gallery wrap caresses the 1.5″ thick edges of your piece with an attractive canvas-y embrace that’s suitable for hanging without a frame. Consult the FAQs for more information. This is a limited 1-day only sale that will expire tonight at midnight (Tuesday, November 9, 2010). Click here to buy now or for more information about the deal. Don’t miss out! Valid only for service purchased. By app’t only, 48 hours in advance. Subject to availability. 24-hour cancellation notice or Groupon is forfeited. Must use in 1 visit. Non transferable. Tax and gratuity not included. Not valid with other offers. Pink Lime Salon & Spa’s skilled aestheticians invite patrons into their fun, vibrant space for a variety of pampering services. The universal contour wrap ($245), a system of bandages soaked in a warm sea clay solution and ready to reduce inches from your corpus, detoxifies and tightens the body before an hour-long mini facial ($85) fusses over the face with a cleansing mask and great-aunt cheek pinches. With the other option, talons and toes transform into elegant extremities with a standard manicure ($35) and pedicure ($55), before a cleansing, exfoliating, and hydrating express facial ($45) freshens up visages for surveillance camera close-ups. 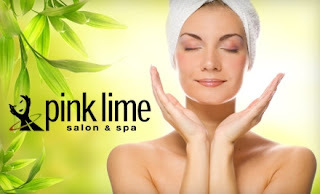 Pink Lime Salon & Spa was named one of the Top Ten Beauty Salons in Vancouver by VancouverBC.com and was praised in SweetLife.